The quest of the self-published author to be recognized is a long and winding road. 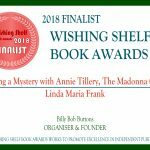 “Making a Mystery with Annie Tillery” is a tool for anyone interested in literature, writing and educating and exposing young readers to what it’s like to be an author, told through an exciting, engaging great teen mystery. The book included book discussion questions, lesson plans, websites and a writing activity. All this is embedded in the author, Linda Maria Frank’s (that’s me), notes, ideas and back stories about the book. But now the hard work begins. 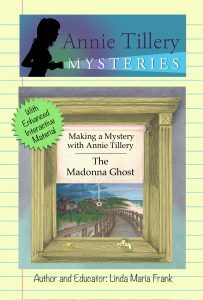 I need to market this book, somewhat like the Annie Tillery Mystery series, but also to the educators whom I hope will use this book. I’m starting with social media. I’ve done interviews on The Authors Show for all the books in the series, and I am hoping readers will listen to these interviews, available here, to see the parallels between the series, and my notes on writing them. Scroll down the list of interviews and find me on June 14. Let me know what you think?